Essential Study and Employment Skills for Business and Management Students offers a comprehensive, one-stop guide that will equip you with all the necessary skills needed to enhance your success both during university and in your future working environment. It covers all the core areas associated with business and management degrees, and offers a unique focus on employability to ensure that you can translate the skills you acquire into professional practice. This third edition has been fully revised to include a new group activity in each chapter, as well as updated activities throughout to reinforce the skills introduced in each chapter. The content and structure of the book has been updated to focus more effectively on core areas such as the use of quantitative data, and the development of professional skills and employability. 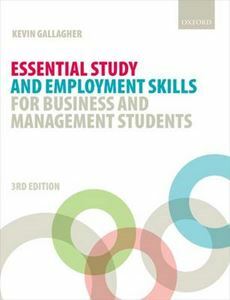 With the main focus of the book firmly on active experimentation and reflection, Essential Study and Employment Skills for Business and Management Students remains unparalleled as a resource to support, encourage, and develop business and management students throughout their time at university and beyond.